A praying mantis is a fascinating insect. Did you know these things about them? Yes, five eyes! You would think two would be enough, right? Not for a mantis! A mantis has to big compound eyes, the ones you will easily notice. But they also have three smaller eyes located on the middle of their head. Those eyes are used for detecting light while the big eyes are for seeing movement and having depth vision. Many other insect species have the same five-eye configuration. Spiny Flower Mantis showing its five eyes: two big purple ones and three simple eyes in the middle of its head. Five eyes but one ear? Mantises are crazy! Not every species of mantis has developed the power of hearing, but some did. 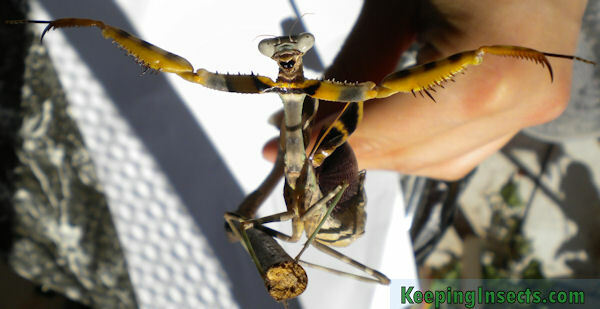 The auditory organ of a mantis is located on the middle of their belly, just between the last set of legs. Their ear is nothing like ours, as it can only hear loud high-pitched noises. Other sounds can only be felt as vibrations but not as real hearing. Why would a mantis only want to hear load high-pitched sounds? To avoid bats! When a mantis flies it can be an easy pray for a bat. At night bats feed on any flying insect and spot them using echo location. The bat will send out a high pitched cry and will listen for the sound bounching off a flying insect and coming back to him. When a flying mantis hears a loud high-pitched sound it means that a bat is near. To avoid being eaten it will make a sudden move and allow itself to fall to the ground. Hopefully the bat was not prepared for that move and will miss his prey. Mantis species that have lost their wings and thus live a life of walking have also lost their ability to hear. When I found this out I was amazed. 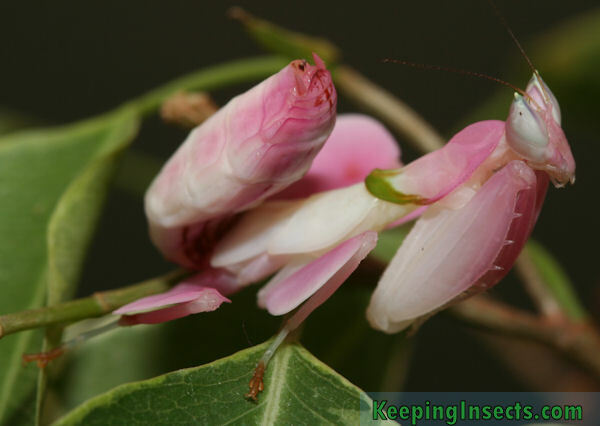 Its not just a pink and white mantis, which is already pretty amazing, but it really looks like a flower. Including the petals, a little green rim and some plant-like lines on its back. The mantis species that looks like an orchid is aptly called Orchid Mantis with the Latin name Hymenopus coronatus. To see is to believe… More pictures can be found at the species page. A praying mantis is not that big. Even the big species are not THAT big, maybe a maximum of 4 inches in length. For sure they are not a match of your average dog or house cat. But do you think the mantis cares? Not really. Sometimes the best defence is the offence. Instead of running away from a threat it will stay put and try to look bigger. It will raise its wings and raptory arms and try to stand as tall as possible. Maybe even rocking from left to right to seem more intimidating. Does it work? Actually, it does! 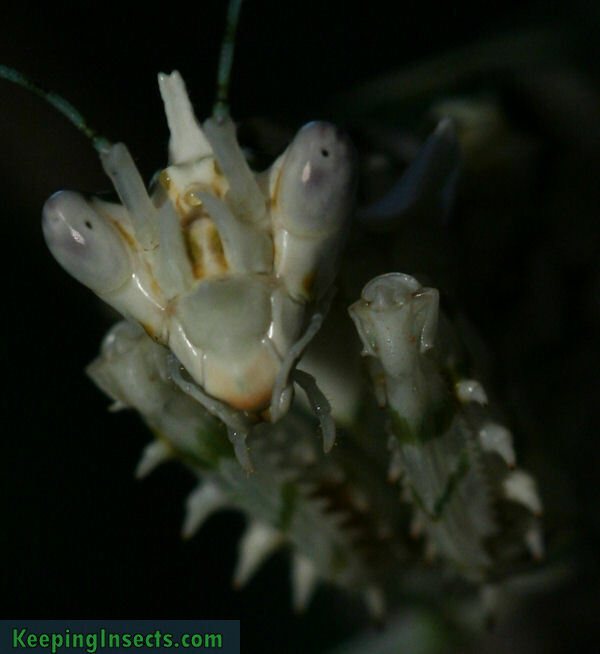 Animals that are not particularly interested in eating the mantis or have not yet experienced this are a bit suspicious of a prey that does not run away. It might be venomous, poisonous or otherwise attack you. Better be carefull and not get too close. Additionally some mantis species have evolved bright colors on the inside of their arms or their lower wings. When resting these colors are not visible, but when attacked they can be flashed to intimidate their attacker. The next short video shows a mantis trying to intimidate an attacker with some “dance” moves. Did you know that a single mantis female can produce more than 1000 young? After mating it will produce egg cases called ootheca that can have more than 200 eggs inside each. And she can make around 6 of them! Not every species of mantis is as productive as this, some species produce much fewer eggs per egg case. For producing this many babies she does not need to mate more than once – talking about one drunk mistake having some long-lasting consequences. 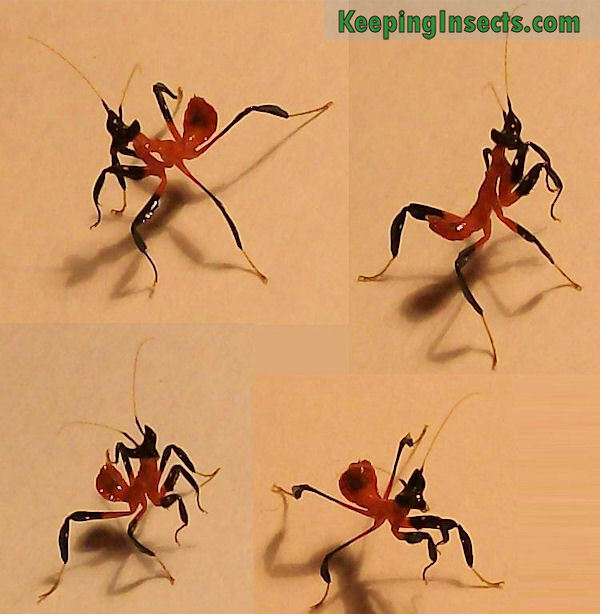 Most mantis species are not easily intimidated and go for the big kill. If they detect a prey, they will go for it. And stay at it, even when the prey turns out to be much bigger than them. An astonishing feat if you remember that a mantis does not have any venom. It just has to hold its prey down with pure force and start eating it. Spiders have it much more easy as they paralyze their prey quickly with their venom. There have been reports of wild praying mantises catching hummingbirds, mice, small lizzards, huge spiders and equal sized other mantises. Only the big species will go for this tactic, for example the Asian Mantis, Chinese Mantis, African Mantis or Budwing Mantis. The more delicate species are more into camouflage and less into bold hunting tactics. You would not see a Violin Mantis or Ghost mantis going for a big kill. This video shows a big female mantis hunting, catching a spider and then almost becoming the prey of another female mantis of the same species.